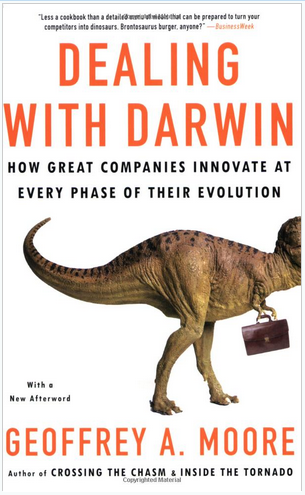 One of my favorite books is “Dealing with Darwin– how great companies innovate at every phase of their evolution” written by Geoffrey Moore. It is well worth a read. When you work through his other books and connected thinking of “Crossing the Chasm” and “Inside the Tornado” you really appreciate the learning stories coming out of Roger Moore’s studies of the Technology Adoption Life-Cycle. We all need to rethink a lot as the new challenges come rushing towards us. In his work Geoffrey Moore talks about ‘traction’ and I think this is a great word for thinking about how to gain diffusion and adoption in product, service or business models, to gain market and customer acceptance. The first post outlined the different theories and establish their value in our thinking. The second post relates these theories into their to achieve success in penetrations of our target markets and increase sales through growing adoption. This is the third and final post in this series, it looks at how Rogers’ theories relate to us in today’s connected world, and in particular with reference to Apple and finally offers up some of the reasons why diffusion can fail to occur. Marketing departments talk penetration, “message penetration, market penetration” and so often ‘force’ customers to become aware and then buy. Does this really work today? I doubt it. Also many organizations hang on to old media ways to get their message across when the use of technology, the internet and social engagement may seem harder but I believe is far more rewarding to engage with the customer on a more personalized basis. I regard this as 1 to 1 of many. 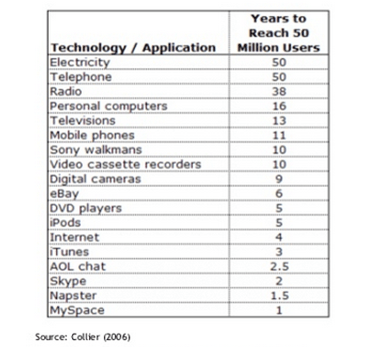 Even this table is already out of date on the speed to reach critical mass. Companies are not just setting hurdle rates on launch dates but demanding innovations that have critical mass in revenue and when they achieve critical mass. It is not unusual to set 18 months to achieve critical mass from the inception to settling on the critical factors that make a value proposition to drive penetration. This can only come through engagement and that comes through technology making the connection to the user. There are lessons for us all to learn here. Apple have not been the first into markets, they are a classic fast learner and follower. Yet they master the convergence of ‘breaking’ technology, design, user experience, pushing materials used and providing ease of use within the make-up of the product, and deliver this ‘bundle’ through the sheer generation of excitement and buzz. The huge difference is their deep understanding of what can be put together that achieves this diffusion and adoption. What can others learn from this integrated approach to product and people? 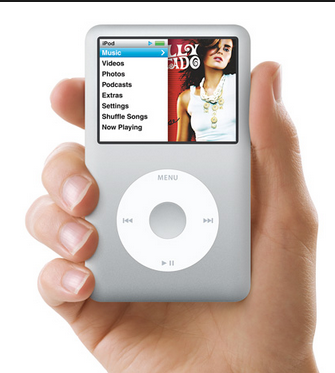 The first digital music player entered the US market in 1998 and it was not until 2001 Apple released the iPod. The market had already shown signs of plateauing at the time of Apple’s launch, which must have been worrying. Yet it was the unique factors of Steve Job’s clear vision of what a musical experience should have, Apple’s superb understanding of design and usage of materials, and its building upon the growing brand recognition and reputation as front edge. Yet Apple also benefited from previous product releases because the behaviours and expectancies were being understood and were able to be articulated far more to validate and confirm Steve Jobs emerging view on what customers actually wanted- their own unique choice of music in the palm of their hand. Steve Job’s innate sense of driving a solution to a winning value proposition by demanding all the parts to be incorporated, often taking uncompromising positions, was the additional factor. For example, being determined to offer a progressively growing store of downloadable music provided that incredible ‘complete’ usage experience. It met an un-articulated need but saw the different signals in its convergence of a total package. Apple gave everyone in the adoption curve something that set their imagination alight. Recommendations compounded so even late majorities and laggards felt compelled to buy, and the sales simply exploded. The basic criteria with the theories of Roger’s Diffusion and Adoption were met. For the consumer, Apple took away complexity. The learning gap became dramatically reduced. It was quickly understood you took your computer out of the box and plugged it in. The complexity of most of our past experiences in complicated set ups, the need to download and fiddle with conflicting software, had been taken away. Apple set about integrating the system and providing a better user experience. It did away with proprietary connections, set USB and CD-Rom drives as their standard, dragging along most in the industry. It again focused on pushing to the maximum from Rogers characteristics of innovation. The iMac proved to be phenomenally successful, with 800,000 units sold in 139 days. 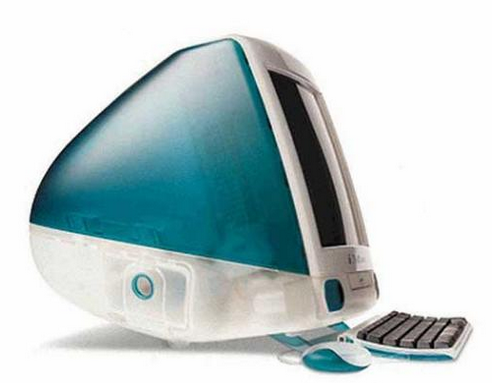 It’s translucent plastic case, originally Bondi blue and later various additional colors, is considered an industrial design landmark of the late 1990s. Again design, attention to details, focusing on user needs to reduce complexity, offer relative advantage, make the way forward as compatible and integrated, allowing a fast set up to gain immediate experience and a great design or observability ticked all the boxes of Rogers Five Factors. Where do you start? The iPad had built-in Wi-Fi and, on some models, cellular connectivity. An iPad can shoot video, take photos, play music, and perform Internet functions such as web-browsing and emailing. Other functions—games, reference, GPS navigation, social networking, etc.—can be enabled by downloading and installing apps. As of October 2013, the App Store has more than 475,000 native apps by Apple and third parties. There have been five versions of the iPad. The first generation established design precedents, such as the 9.7-inch screen size and button placement, that have persisted through all models. The iPad second generation added a dual core Apple A5 processor and VGA front-facing and 720p rear-facing cameras designed for FaceTime video calling. The third generation added a Retina Display, the new Apple A5X processor with a quad-coregraphics processor, a 5-megapixel camera, HD 1080p video recording, voice dictation, and 4G (LTE). The fourth generation added the Apple A6X processor and replaces the 30-pin connector with an all-digital Lightning connector. The iPad Air added the Apple A7 processor, the Apple M7 motion coprocessor and reduced the form factor for the first time since the iPad 2. iOS 5.1 added Siri to the third and fourth generations and the iPad Mini. 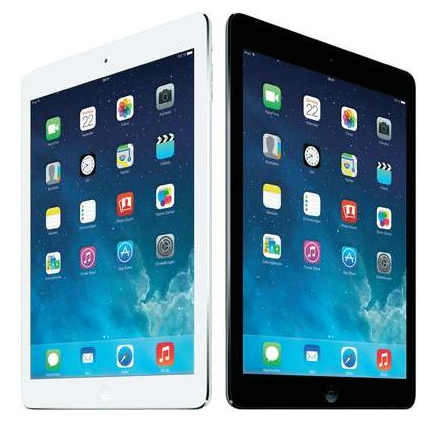 There have been two versions of the iPad Mini. Apple were delivering wave upon wave of new technology in a rapidly accepted format. A story of design, combining technology, understanding the unmet needs of the market, combining revolutionary materials. It filled a need, and it ticked all the boxes again of Rogers Five Factors of Product. Yet we had by this time the real effect of the People Difference. Apple have such a powerful body of innovators and early adopters creating such a pre-launch noise, it draws in early and late majorities. Apple has been a fashion ‘must have’ statement. Demonstration of products in Apple stores are ready to be put to any user test, the staff are providing you a ‘user experience’ and support structure that understands our needs and provide all your personal reasons to adopt. The advocates of Apple products are phenomenal. They are nurtured, engaged with and pampered, as they generate such chatter and noise it can’t be ignored. 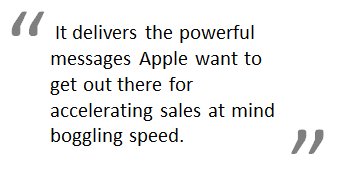 It delivers the powerful messages Apple want to get out there for accelerating sales at mind-boggling speed. 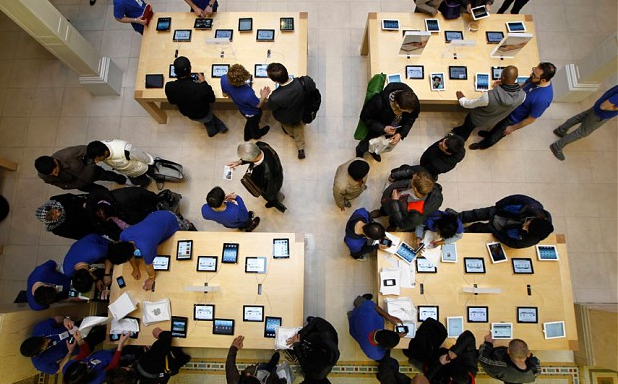 Apple has institutionalized its product and people diffusion, and adoption process – can you? We can all take away some powerful learning from this by aligning the theories of Rogers, articulated originally in 1962 and see how they seem highly relevant to Apple’s approach to its thinking. They have added triggering (conversations, user experiences) with contagion and have been working the different tipping points to gain market traction, penetration and constant appeal to stay up to date and in tune with the latest and greatest. 10. The product or service offers no really clear value proposition to switch and buy. I’m sure you could add a few more but I leave those to you. The principles of diffusion and adoption I believe are both important in innovation. Working the diffusion and adoption theories and putting these into your practice is something that needs an integrated approach, it might develop over time, perhaps through serendipity but knowing its principles helps you begin to map out the pathway. This is the third and final post within the discussion on exploring diffusion and adoption for innovation. This entry was posted in Molecules and tagged adoption of new innovation practices, Clayton Christensen and Innovation, common understanding of innovation, deeper innovation understanding, diffusion and adoption, diffusion of innovation, Everett Rogers Diffusion of Innovation, Explaining Diffusion and Adoption, exploring theories of innovation. Bookmark the permalink.